I don't plan on doing these weekly for very long (maybe just until the first month), but I've always found them interesting on other blogs so here we go! *Is hitting a growth spurt. 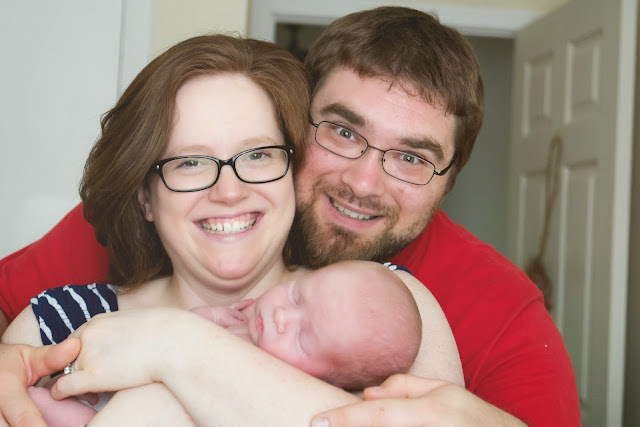 At his two-week appointment he had surpassed his birth weight (six pounds, 14 ounces), and was seven pounds, nine ounces, what what! He's eating more frequently lately and is even starting to feel heavier! *The picture above is so Parks - this is what he does when you feed him - puts his hands up near his face (or on his face - we're working on him not scratching himself), locks eyes with you, and it melts my heart every time. *Makes the funniest sounds! There are times he sounds like a squeak toy, a kitten, and we've even named a few of his cries (all because of how they sound): there's the "pterodactyl," the "tea kettle," the fake "I don't care for this" (usually reserved for making him burp or changing his diaper), and then "on a scale of 1 to even I just can't" cry. (Normally when he's really hungry). *I am now "officially" exclusively pumping. I've been doing this since the day we came home from the hospital, but with the intention of trying to get him to latch on. 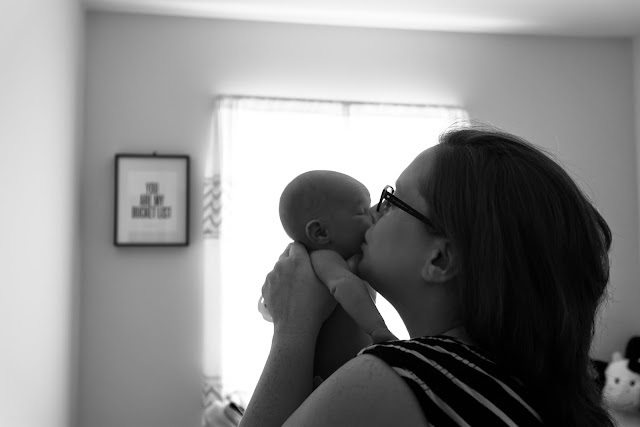 However, we've tried everything under the sun, have seen two lactation consultants (not to mention my mother-in-law who used to be a lactation consultant), and Ben and I have decided what we're doing is working so that's what we're going to continue. 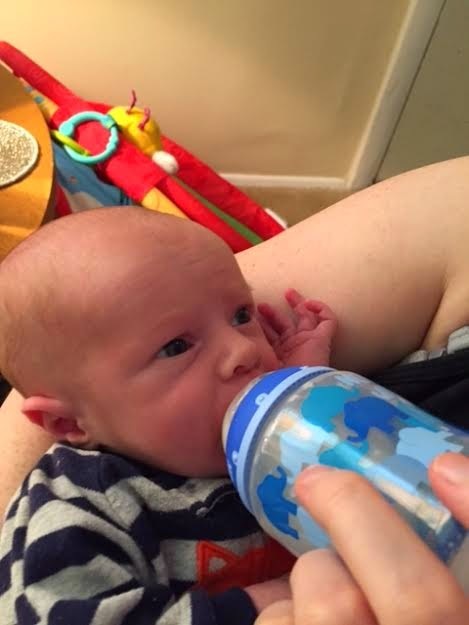 I've never cared about breastfeeding vs. bottle feeding - my attitude is do what is right for you and your child - but of course when you're in a situation (and hormonal and tired), it's hard to have that perspective. There were times I felt like a failure because I couldn't get him to latch, but I'm still getting him milk and pumping is a pretty rigorous schedule (not for the faint of heart), so I'm proud that I'm able to provide for him and it's working! *I had a great two-week appointment as well! The doctor checked my incision, told me I'd lost a lot of weight and was healing well, and all the nurses cooed over my son - I'd like more appointments like that please! *Despite the wall I hit one night, my confidence as a new Mom is starting to build. There are times when I'll say "oh babe, try this," or "give him a minute because this is what's happening," and not only am I right, but I realize I'm the one who knew that, and it makes my Mom heart happy! *Survived my first outing by myself without him. I was cleared to drive at my two-week appointment, so a few days later I made a quick trip to Buy Buy Baby alone; it felt so nice to drive - like that was something that was "back to normal," but it also felt really weird to not have Parker with me in the store. I was only gone for an hour but when I got home I was definitely ready for some baby snuggles! *Are surviving! Ben and I have done the "night" shift by ourselves a few times now (our moms have been phenomal about taking turns staying the night), and while it's exhausting, it's slowly getting better and we're working out a system for ourselves. *Still manage to laugh a lot! The other night I was changing Parker and talking to Ben when all of a sudden Parker started peeing - straight up, on himself and the changing table. It was so unexpected I gasped and then started laughing. We decided we'd give him a little sponge bath to get him cleaned up, so I undressed him completely, wrapped him in a towel, and handed him to Ben. Ben and I were still talking as I was wiping down the changing table, and without even thinking about it, Ben leaned down and kissed Parker's head, then made the funniest face and cried, "Ugh! Ew! That's where the pee is!" I could. not. stop. laughing. To the point where I told him, "stop making me laugh, my incision hurts," to which he replied, "I'm not doing anything!" Oh my gosh you guys. The best. *Are loving the natural care line of diapers from Huggies. A couple of brands have this now, but one of the reasons we love them is they have a green line down the front of the diaper, and when it needs to be changed the line turns yellow. It's such an easy way to see if he needs to be changed - although some friends of ours think it's totally cheating. Ha! Tomato, tomah-to! Love all of these updates, as you know. Thanks for sharing! You are doing such a great job, xoxo! Oh, and how could I forget? Parker is ADORABLE and sounds like so much fun too! Darn! I tried to comment and blogger ate it! Boo! Anyways I am really glad that pumping is working well for you guys! I"ve watched a lot of friends become moms and one of the many lessons I have learned is to be open minded about how breast feeding/pumping etc will go as it's different for everyone! Parker is such a cutie! You guys are doing such a great job! And I am happy to hear that you are feeling more confident in yourself!!! that first picture kills me, so so cute! and oh my goodness, yes to the laughing. sometimes i just can't get over how ridiculous things are even when it's awful. laughing truly helps put things at ease.